Hi guys. I know I haven't been on this forum for a while, mainly because I was on Twitter. Anyway, on Twitter, I said some things regarding the localisation of R&C PS4, which was delayed by 10 days after everyone else. It was already delayed by 8 days, which was annoying, but the extra 2 was just the last straw. This wouldn't be a problem for most of you, but I have a deep emotional attachment to the Ratchet and Clank series, so I want to experience the game on release day for myself. I always give in to temptation, so this time I'm going all in. I'm hiding my laptop and iPod to avoid everything Insomniac isn't giving us beforehand. Anyway, I live in the UK and I just gave up. I didn't understand why we at least couldn't get the PS4 theme, or for it to be released on the PS store for everyone. (I understand why the bouncer is pre order only, as much as I disagree with it) So I got mad. I presented my argument in the wrong way, comparing localisation to racism (which it basically is, by definition. But I know why people would get offended.) And the character limit for tweets really didn't help. I wanted to make a difference, but I made a scene instead. 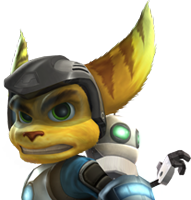 I want everyone in the Ratchet and Clank community to know that I am sorry for what I did. We can all learn from this experience since the release date is approaching rapidly and hype is starting to get the better of some of us. I would also like to apologise to Insomniac games for all the spam and stuff, because I know how they feel about the localisation. They probably blocked me, and might now have the wrong idea about me. I'm not usually like this. My twitter is @PCG1337 if anyone is interested in getting involved with the discussion on the localisation. Once again, I'm sorry. I thought I was doing the right thing with my little protest, but it got ugly. Calm down. I know you wanted the game real bad. I feel you. Here, im Indonesia, we haven't got any info about the PS4 game's release date. Not even we can pre-order in the PS Store. Well, maybe just delete your angry tweets, apologize to those whom you have bashed, and just relax. We're still lucky Sony and IG haven't entered the Dark Side like EA did. And they surely won't let the fans down. PS: stay open-minded and don't set your expectations too high, so you'll enjoy the game. Worked for me when Star Wars Episode VII came out. Thanks. It's not just about this by the way, before everyone thinks I'm a complete idiot. I'm very stressed at the moment with school stuff, it was a long day and to find out that my countdown was basically going backwards didn't help.